time in which they faced any enemy with significant naval forces. But can this highly desirable situation ( at least for Big Carrier advocates) last for long? Even Britain's mighty dreadnoughts finally were tested almost 100 years after their last similar conflict at sea, at Trafalgar. 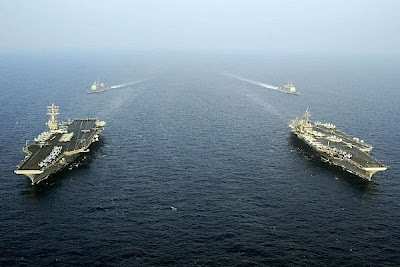 You would think, with no equal threat facing these costly and budget-shrinking powerhouses, the Navy might have weaned themselves off and turned to less costly but effective counters to Third World conflicts. But that would be too sensible.